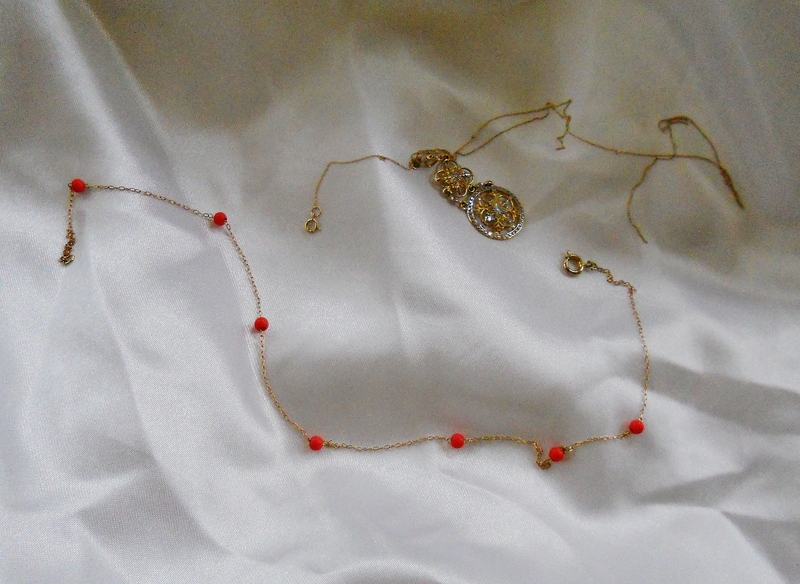 Saturday night I discovered my coral beaded choker had my favorite gold necklace in a stranglehold. I was thrilled to find the misplaced piece of jewelry and horrified at how their fine chains had knotted together. At around 8:00 PM, I began picking the delicate balls of gold apart, believing it would only take a few minutes. The plan was to watch a movie on Pay-Per-View. As the minutes turned into hours, my husband watched Papillon while I continued to struggle. By the way, that soundtrack is the most repetitive and irritating ever! By 10:45, I was still untangling the gold mess when my husband announced that he would finish watching Saturday Night Live up in our bedroom. At 12:10, I finally yelled, “Screw you, stupid chains! I will have you melted down instead. I wasted my whole Saturday night because of you two!” My index finger and thumb were raw and I wondered if there was any benefit from absorbing gold through the skin. “It’s probably toxic,” I thought. Sunday morning, I woke with a pang remembering my misspent Saturday night. After walking into the kitchen, I glared at the fighting chains and sat down for one last try. In less than 15 minutes, they slid apart. “Woohoo!” The gold one was broken in a couple of places. I could have cut it, saving some time. Oh well. How much time did that take me? Close to four and a half hours! That is ridiculous! And yet I saved one of the chains, so I guess it was worth it. But who else would do that? I never give up even when I should. Persistence and determination are great qualities to have if you are a writer like me, but not so much in other occupations. It occurred to me that I would make a terrible emergency room doctor. If a patient flat-lined, it might take days before I would “call it” and check for the time of death. After writing this, I ate dinner at a Chinese restaurant. Look at what my fortune said. Can you believe it? What the heck does it mean? As a writer, I will continue to forge “ahead,” never give up, and pray that I am not drop-kicked! I think your persistence was worth it because it taught you a valuable lesson about yourself. Next time, just cut the damn necklace – LOL! Seriously! I wonder if I could. I think it is so deeply ingrained to take up a challenge that I would still try…. Maybe if the now broken gold chain fetches a good price, I will jump at the chance to melt the next one down! Thanks Julie! I would have given up on the Gordian Knot when I first saw it, sat down and wrote something about it. Anyway, covert relations between jewelry is a little known phenomena. You’re supposed to close the jewelry box and they’ll untangle when they’re done. Hahaha! They seemed to have come to some kind of truce by morning since they untangled so quickly! That coral necklace IS so beautiful! I’m afraid I’m like the opposite. I don’t have enough determination to finish a project, I’ll likely give up and start reading blog posts or something. 🙂 …unless it involves a story. I always have to finish the stories I’m writing, or reading. That’s good! I don’t always finish books. The one I am reading is an autobiography and I’m tiring of hearing “memememe Myselfmyselfmysef, IIIIII. I think I will read the Hunger Games instead! Sounds to me like it was totally worth it. In fact, I’ve spent a decent amount of time in my own life untangling something or other–generally worth the effort. Congrats on your success.! Even worse when you’ve invested all that time – not giving up becomes a matter of pride. Yes pride. Isn’t that one of the deadly sins? Thanks El Guapo! I’m the same way. Once I start something, I become pretty obsessed with finishing it. Even if it takes forever. Which is why the book I’m currently writing will be done once I’m around 80 years old. But it will be done, dammit! Are you reading Shantaram? That is a looooooong one! For me, it depends on the project, but if it is challenging, I am in for the long haul! Thank you for writing this. It makes me slightly less ashamed of my attention span. Both it and my memory are about like those of a gnat. BTW, wish you’d hidden in Piper’s luggage and come to Fort Worth this last weekend for the DFW Conference. Would love to have met you. I have done this before, too! It is almost an inner challenge for me to get things “fixed” correctly. I can completely relate! I am so happy you can! I think this is why I loved puzzles when I was young. I would keep plugging away at it! Thanks Jean! I think that’s great that you never gave up, those delicate chains on some necklaces easily get tangled, you don’t realize until you go to get one out of your jewelry box and then the horror hits. That is such a great idea! I am going to do that! Thanks Mags! I link that. 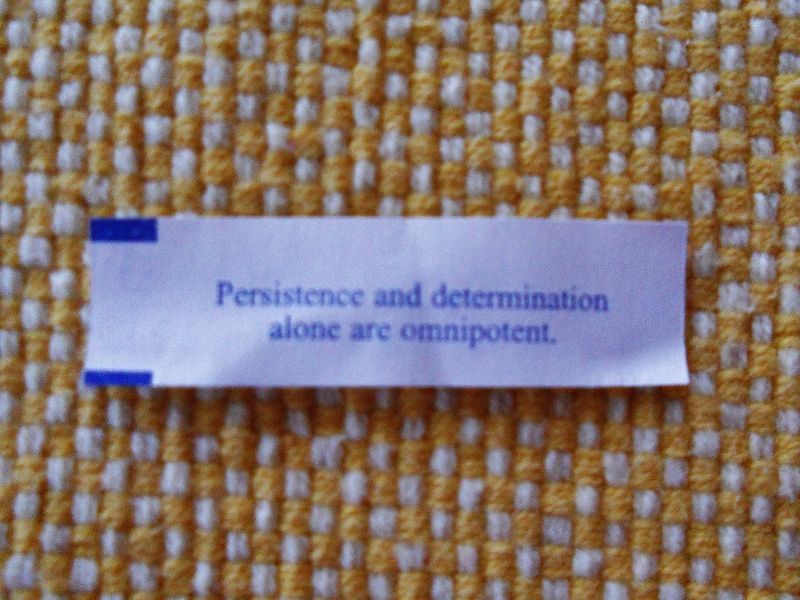 Persistent to the point of omnipotent! I can’t wait until that really kicks in! I could use that power in my tennis matches! I sometimes think that Google Chrome is the monster inside my computer…. I am glad that you got them finished! Check it off the list! The key here is you got the necklaces separated!! From one determined stubborn veteran of many wasted Saturday nights and otherwise: good on you!!! Thanks El! I needed that! I really don’t ever want to be defeated especially by an accessory. Oh I admire you! I would have ripped the jewellry apart in frustration! I wanted to, but I kept thinking…one more minute, just one more minute…… Thanks JM! We are a lot alike. I hate to give up. Give in, too. But, Susie… I do believe I read the word favorite in the second paragraph. So, maybe there was a little love involved in that untangling project. Your husband is a man of infinite wisdom, to watch SNL in another room, while you continued in your Gideon’s Knot Quest kind of thing. You are so right Ted! It is my favorite. I slightly miscalculated how much time it would take me…. by a few hours! Susie, this calls for a story: Susie vs the evil bloodthirsty necklace. That is hilarious! Even I am on the edge of my seat. Hahaha! When I saw the title of this post, I related wholeheartedly. Of course I was busy untangling spirits and other conclusions, but it’s all about persistence and determination . . . either way? True that! I try to keep my spirits as untangled as possible. I don’t think there is! If it is a mere task of mundane importance, I have no interest, but bring on those challenges! Wow, talk about perseverance! Glad you saved one of the necklaces. Depends on how tired I am tackling something challenging before I call it a loss. There are certain things I start and just can’t stop at, like pulling weeds or messing around with some new technique in iMovie. It’s strange how far we can push ourselves at times! Another fun post, Susie! Thanks Lynn! It does seem weird how I am wired for certain projects and others I have no problem blowing off! Sometimes I get like that on the computer too. I look up and can’t believe how much time has flown by! Great post, sweetie! Btw… I love Papillon… hate the soundtrack! Lol! I’m with you… I could never make the ‘call’ in the ER. Hurricane? It’s just a little wind, ya sissy! Hahahaha! I wouldn’t be here today if I had given up when it seemed there was nothing left… no hope… no way out. But… Mama didn’t raise a quitter! Want to hear my tangled necklace ‘tale’? I did the same as you one time… spent hours trying to untangle two necklaces that I’d thrown in a drawer and forgotten. I came across them during ‘spring cleaning’ a while back and realized that one of the necklaces… a gift a friend had brought back from Mexico… I had never worn. A fine silver chain with beads of turquoise and a beautiful turquoise ‘tear-drop’. I finally got the necklaces untangled… Tina had gone to bed hours before. Anyway, I wore the necklace the next day… got several compliments on it. That evening though, Tina says… “Roni… what is that on your neck?” and she didn’t mean the necklace. That ‘silver’ chain wasn’t… silver! The da** thing had left this greenish-grey ring around my neck! I thought I’d never get it scrubbed off! So, is there a moral to the story here? Sure there is. Will I remember it the next time I get a bit too persistent about something? Probably not. Dang! It left a ring-around-your-collar! Bummer.. Hahaha! I know that metal will do that sometimes! Too funny! You do sound persistent which can be a great quality. I think it is better to err on that side than on the quitting side! That was hilarious. I’m sorry about your frustration but that was too funny. That’s happened to me lots of time with untangling computer wires, and also chains mixed in with rings. I couldn’t let the chains beat me. 🙂 I LOVE Papillon, great movie. I never did get to “see” the movie! Computer wires can be the worst. I can’t wait until everything is cordless including the vacuum cleaner! Maybe I should get one of those little robot vacuums…. In the meantime, I have learned my lesson and will store my chains more carefully! Perseverance is a positive, Susie! Don’t ever change! There is no changing me at this point Hook. Thanks!